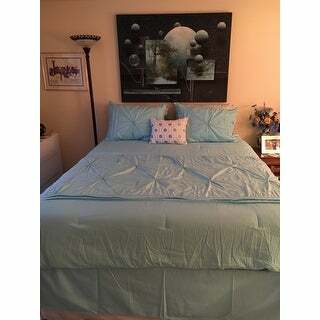 this comforter set is very pretty, it fits the bed perfectly and the color is true to the picture on the post. I would recommend to anyone looking for a bright and light set. The Intelligent Design Devynn Comforter and Sheet Set flaunts a casual elegance to glamorize your space. Alluring pleats with embroidery adorn the top of the comforter, adding beautiful texture and dimension to the bedding set. Stylish sham(s) display a similar pleated design and embroidered detailing seen on the comforter for a fully coordinated look. The colorful chevron sheet set features beautiful hues on a white ground to add a fun splash of color and style. A gorgeous decorative pillow further complements the comforter set, while the solid color bed skirt provides a crisp and clean finish for a fashionably chic update to your bedroom. Dimensions 90.0 In. X 90.0 In. X 1.0 In. I love the color and feel of this bed in a bag set. It really sets off the dark wood of the bedroom set. The sheets also feel very nice and the decorative pillow and shams look great! The color is beautiful and was exactly what I needed. Great value too! I did need to wash the sheets before using them as they retained a bit of plastic smell from the packaging but they were fine after that! I would recommend this set to anyone. Great quality and it's beautiful. My teenager daughter give it a 5 stars. We washed it before we used it. Still as good as new after it come out of washer and dryer. This comforter set is really beautiful. I don’t know how it will launder but it looks fabulous. My daughter loves the color and quality of this set. Comes with everything you need for your queen size mattress. Would but this brand again if need arises. Wasn’t what I expected but works well for my granddaughters room. found the perfect color to match my summer colors, always finding great deals on overstock, will continue to shop always looking a good deal! My daughter loves this bedding set. It is very pretty. "Can you purchase curtains to go with it?" No, they are not available. Price and quantity of items that comes with it. It looks nice as well. I love the color! The price is great!